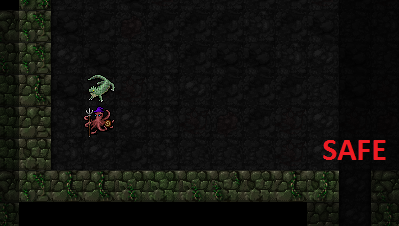 Octopode Wanderer is one of the most unique combinations in Crawl. Octopodes have the most item slots in the game, but since most of those slots can only be filled by rings, which are rarer than armour, they tend to be highly vulnerable to damage for much of the game. However, when an Octopode has accumulated a lot of rings later on, they have access to some extremely powerful combinations of equipment. Wanderer starts with randomized stat contribution from class and a randomized selection of items and skill levels. 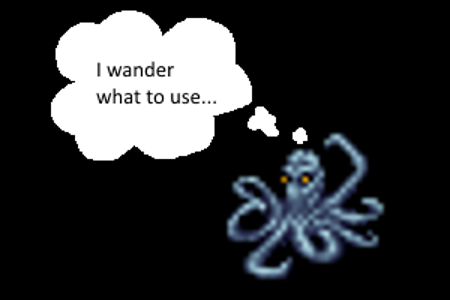 Therefore, Octopode Wanderer has one of the greatest incentives to adapt to and make the most of what you find in the game. This can be a fun experience for players who want to learn to leverage combinations of gods, items, and spells that they might not normally use. This guide is actually for playing an Octopode that doesn't have anything, which is what all my Octopode Wanderers seem to be on D:1. I could compare different Wanderer starts and talk about potions of lignification or something, but for the most part the Wn part of OpWn is the same as every Wn. Obviously, look at the items you start the game with to decide if you have a weapon you want to use or any access to spells, and train your skills accordingly. First of all, you're going to need EV on this character. That's a huge priority because EV is what's going to allow you to win fights one on one. The first handful of times you play this character you might just straight up die in melee, and that's fine. Eventually, you'll have the experience to know what to do when a monster hits you, based on how much damage you took. But if you never try and learn, you'll be missing out on the best move in every situation in which hitting the monster is best. Due to constriction, your damage is very good in the early game, almost like a Troll's in practice. So while you might put a couple of initial points into a weapon skill, you're going to deviate sooner than normal to raise Dodging. You're also going to take Dex at levels 3, 6, and 9, after which it's up to you if you'd rather have Dex or Int. A spear is a great early weapon for you; the reach attack plus the increased tentacle damage while up close will kill a lot of monsters in two hits before they can damage you. The majority of fights are very winnable for you as long as you fight one on one (otherwise, it might be acceptable if you're buffed). You don't have to lure monsters any massive amount, but at least let them come to you. If you are kiting a monster or waiting until it comes to you, you might find it helpful to move diagonally - the less monotonous motion will keep you more aware. 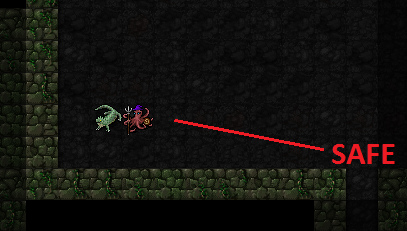 Remember that monsters aware of you are almost always trying to take the shortest path to you - by understanding this and finding the best tiles to be on you'll be able to move and ambush monsters as if you were invincible. You pretty much always want to rest to full HP after each confrontation, and resting on a level you've just entered is always bad. If you need to rest and you're near an upstairs, just rest on the level above you. Whenever you're in trouble, look at the terrain first. Terrain and your position among it are crucial in deciding what you or monsters can do. And the last thing you want to do is burn consumables to get away from an orc warrior only to realize there's a shaft you could have led it into. By Lair you should have at least 20 EV, 7 or so Fighting skill, and either some strong early game spells or a decent weapon (an ego spear/trident/whip/rapier etc. or anything better is acceptable). If you found a buckler you have one of those on and probably 4 Shields skill. If you found any good wands or evocables you might have around 6 Evo. Once you master fighting without AC, knowing how to play this character is just knowing how to play Crawl. You raise the appropriate skills so that they continue to grow in power throughout the game, and you evaluate equipment choices and combine them in the way that gives you the best chance of winning. Your god selection should depend on how you end up developing the character and on which gods you enjoy using. For example, you might be playing your Octopode Wanderer unarmed, in which case two gods that synergize well would be Okawaru (Heroism) and Makhleb (heal on kills). Or you might have started the game with or found some early conjurations spells and want to worship Vehumet, and so on. However, one god that does work well with almost every Octopode is Gozag. Potion Petition can strengthen your early game, where Octopodes are weakest, and the additional shops can fast track your set of 8 good rings. Position is everything. From here, you're relatively safe from whatever's in the hallway. It certainly can't overwhelm you, at least. 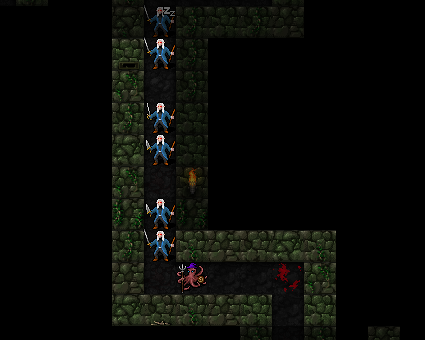 Every time you kill the closest elf you can recreate this position by moving one tile (for example East), which will pull the next closest elf to where you want the front of the line. You then move back one tile into melee range - this will give up an occasional free hit or ranged attack but it also prevents any of these deep elves in the corridor from casting their spells, since they can't see you. From here, all of the monsters have vision of you and can use relevant spells or abilities, or even a potion. "A killer bee comes into view. The killer bee buzzes angrily." In this example, the player has just aggroed one out of presumably many bees. Retreat past the X below, and dispatch the first bee quickly when it catches up with you. You can then move upstairs or into a room to rest up, and by repeating this maneuver you can kill the entire pack one by one. This works for any other band, such as orcs. Finally, try to never hit a monster with another monster wandering in line of sight - the wandering monster will be guaranteed to notice you if you melee anything within range of it, including poking a plant with a dagger. Even though you might take a couple hits walking backward, hitting this bee here prevents aggroing the second, wandering bee. 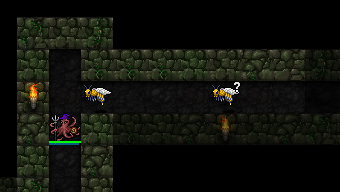 While attacking the closest bee saves you the damage from walking backwards, you have now aggroed the second bee. You may end up low on health after finishing off the first bee and immediately facing a new threat. 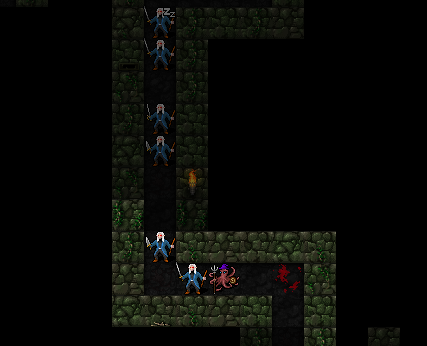 This is how people die in crawl. Try to always identify the direction of the safest area. All things being equal, never meet a monster on this side to attack. Instead, meet on the side with a straight line to the safest area. This may seem tedious to do, but it'll quickly become second nature and not tedious at all. In fact, your games will take on a fluidity and rhythm to them. mikee has been playing Crawl since 2003 when it was still Linley's Dungeon Crawl. Since then, he's assembled an extensive resume which includes tournament glory, a record-breaking winstreak and the design of all sorts of things (including a vault containing many crabs). If you'd like to offer mikee a job in Hearthstone, you can find him in ##crawl IRC where he'll likely be performing beat poetry or telling "jokes".